Upper Grand Canyon Rafting Trips | 5-6 Day Journey | Hike Too! Rafting the Upper Grand Canyon is an amazing experience in a wondrous place full of legendary landmarks. These landmarks include: Vasey’s Paradise, The Little Colorado, and Redwall Cavern to name a few. While the most infamous whitewater is found in the lower canyon, the Upper still holds some major rapids such as Nevill’s and Hance. Starting at Lees Ferry the Canyon opens to us as we begin the float into its vast interior. It starts as a narrow, sheer-sided chasm, winding through the uplifted Kaibab Plateau. The first 61 miles of Marble Canyon is the most photographed, perhaps the most scenic portion of the Grand Canyon. The rim moves away from view as the Canyon broadens to its full expanse of 13 miles. Then we enter the foreboding inner gorge with its exquisite polished granite. This gem of the Colorado is indeed one of the most scenic places on earth. The Upper Canyon whitewater rafting trips involve a 9-mile hike out of the canyon from the Colorado River to the South Rim and are only recommended for those in good physical condition. You can choose between being a passenger or a participant on these whitewater river trips with both Oar Raft and Paddle Boat trips offered. Reservations should be made well in advance as demand for this world-class adventure is high. Grand Canyon trips are run by Holiday River Expedition’s affiliates who are authorized Grand Canyon concessionaires. We meet for your trip: The night before you'll go to the Marble Canyon Lodge for orientation by Outdoors Unlimited, our affiliate in the Grand Canyon. Overnight accommodations are recommended at Marble Canyon Lodge and can be arranged by Outdoors Unlimited. It's a quiet place just five miles from Lees Ferry and only a short walk to the canyon rim and the awesome overlook at Navajo Bridges. Bright and early the next day, your Upper Grand Canyon whitewater rafting adventure begins... at the historic Lees Ferry. 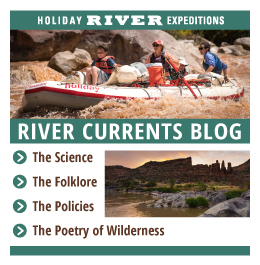 Our 5, 6, and 7-day white water rafting trip of the upper Grand Canyon covers 88 miles of river from Lee's Ferry to Phantom Ranch (Pipe Creek Beach) and the ascent to the South Rim. The night before the trip begins we meet you for the orientation meeting at Marble Canyon Lodge. As mentioned before, overnight accommodations are recommended and can be arranged by you through Outdoors Unlimited. The next morning, the trip leaves Lees Ferry and floats into Marble Canyon. The canyon was named in 1869 by its first explorer, Major John Wesley Powell! It's polished limestone, layered with bands of sandstones and siltstones rises dramatically above the river with each mile passed, soaring thousands of feet to the rim. This same seemingly impervious limestone has allowed the river to scoop out the huge expanse of Red Wall Cavern at the river's edge, one of the many attractions in this stretch. The sequence of rapids through this 88-mile float couldn't be better orchestrated. Beginning with the medium sized (Canyon Scale!) Badger, House Rock and Unkar rapids, the crescendo begins with Nevills rapid then builds quickly with Hance (the longest) and Sockdolager. Amplified by the imposing walls of the Upper Granite Gorge, the grand finale hits its high notes at Grapevine and Zoroaster rapids, and the last few miles finish with a quiet serenade. After the trip: The trip will culminate in a 9 mile hike out of the canyon from Pipe Creek Beach to the South Rim of the Grand Canyon. You can spend the night at the South Rim and either Fly or Bus back to Las Vegas. I really liked each of the guides. They were very different and each had his/her strengths and distinct personality. The blend truly added to the experience. Thank you again. What a great family trip that my 22 yr old son and my 14 yr old son loved. Rapids were fun, but not gnarly-scary. Loved the optional hikes to petroglyphs, ruins and how much our guides knew about the canyon. We all loved the Little Colorado day. Overall, there was spectacular scenery and we had a fabulous trip. The last time I had been on a raft, I was a giggly 16 year old. Fast forward 23 years, and I was heading out on the Grand Canyon. I pretended not to be nervous, but I was! As the hours turned to days, and I learned what river time meant, I have never been so relaxed in my life. Your guides took complete care of me both physically with delicious food, and psychologically with calming words of encouragement and expert boat handling skills. Soon, I was wahooing my way through the big rapids of the Grand. Is my life changed? I'll say so. Thank you!